[180 Pages Report] The global Context Aware Computing Market size was USD 12.60 billion in 2012 and is projected to reach USD 119.90 billion by 2018, growing at a Compound Annual Growth Rate (CAGR) of 35.2% during the forecast period. The context aware computing report consists of market opportunity analysis of platforms and technology adoption in contexts, vendors, and networks. The report explores some of the major sub-segments of contexts market: computing context, user context, physical context, time context; vendors market: device manufacturers, mobile network operators, online and social and web; and networks: wireless cellular networks, wireless local area network, wireless personal area network, body area network. The report focuses on industry verticals and products and also provides market data, market dynamics (drivers, restraints, trends and opportunities), key players, and competitive outlook. The context aware computing market is segmented based on regions such as North America, Latin America, Europe, Asia-Pacific (APAC), and Middle East and Africa (MEA). The market forecasts are provided for each region from 2013 to 2018. The CAC market report profiles leading companies such as Apple, Amazon, Facebook, Google, Microsoft, and Nokia. To analyze the market dynamics that describes factors currently driving as well as restraining growth of the market, along with their impact in low, medium, and high. The CAC market is segmented on the basis of revenue generated across locations by types such as context, vendors, and networks. The CAC market is segmented on the basis of products such as active maps, adaptive phones, augmented reality and guided systems, conference assistants, cyber guides, fieldwork, location-aware information delivery, web browsers, office assistants, people and object pagers, shopping assistants, and others. The context aware computing market is classified into different industry verticals such as academia and education, banking financial services and insurance, consumer goods and retail, energy and power, gaming, healthcare, logistics and transportation, manufacturing, office and commercial environments, oil and gas, public sector and government, residential and home environments, telecom and Information Technology (IT), travel and hospitality. Geographical locations are classified into North America, Europe, Middle East and Africa (MEA), Asia-Pacific (APAC) and Latin America. 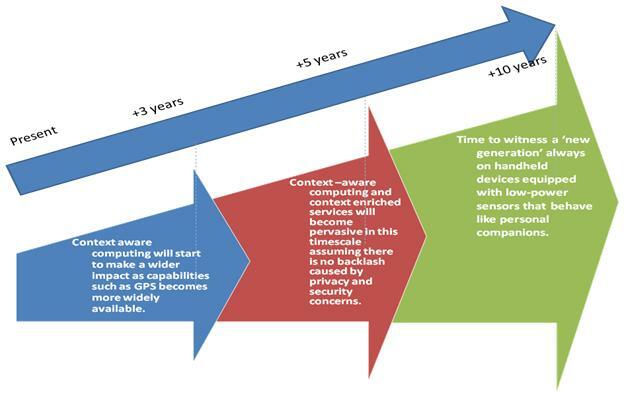 Context Aware Computing (CAC) applications and technologies deliver personalized information to users based upon his location, proximity to other objects, social context, activity and environmental factors. Mobile and other computing devices can perform context-triggered actions based on the user context to provide enhanced end user experience. Big players such as Apple, Intel, Nokia, Microsoft and Google are focusing on creating context aware Application Programming Interfaces (APIs) for developing innovative commercial applications. The increasing surge in the use of smartphones and social networking platform has opened new avenues for contextual advertising by marketers to pursue targeted marketing campaigns to enhance revenues. Contextual advertising helps social networking platforms to monetize their site as well as provide personalized user experience and increases Average Revenue per User (ARPU) for network operators. Currently, although Context Aware Computing is seen in a nascent form through Location Based Services (LBS), more interesting solutions based on CAC have come up which can be applied across various industries. The Context Aware Computing market by geography is expected to grow from $12.60 billion in 2012 to $119.90 billion by 2018, at an estimated CAGR of 35.2% from 2013 to 2018. The technology roadmap below provides the time-frame expectation of context aware applications and the services that will deliver personalized information to the user which is based on their identity and preferences and that can be activated by where the user is i.e.,(location and environment, as well as the time of the day and what the user is doing. The annual growth rate for this market is expected to continuously rise from 2013 to 2015, as the market is still in its initial phase and gradually gaining acceptance by the industry. The annual growth rate is expected to slow down from 2016 onwards. Companies want to reduce their IT and business communication expenditure, so the next three to four years will reflect high growth rates for the context aware computing market. *Details On Overview, Products & Services, Financials & Strategy And Analyst Insights Might Not Be Captured In Case Of Unlisted Companies.